Mother's Day is Sunday May 11th - have you bought something special for the Mom, Grandma, Sister, Aunt or other special woman in your life? If not, no worries! I've just tried the Dove Chocolate Discoveries Sea Salted Caramels and they are DIVINE! Shhh - I'm not telling hubby. After the perfume I received for Mother's Day a few years back... from the dollar store... I went ahead and did damage control for this year and ordered myself a box! 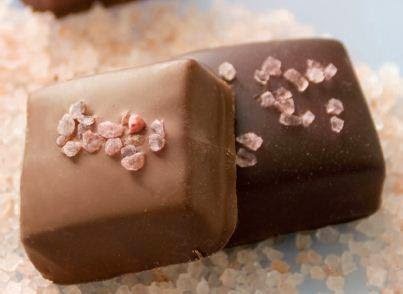 Milk Chocolate with Murray River Pink Salt from Australia: With its apricot-colored flakes, this delicate and wonderfully mild salt melts quickly on your tongue. Dark Chocolate with Bolivian Rose Salt: This South American beauty sparkles with exceptional flavor and a gorgeous rose color. Submit your order by April 30th and choose Direct Ship in order to get them delivered in time for Mother's Day!! On sale for $29 and includes Mothers Day Card!! Edition Reviewed: Sample received with my Chocolatier Kit! I'm a Dove Chocolate Discoveries Chocolatier - Love Chocolate and want to have fun earning some extra money? Let me know and I'll give you all the details - it is fun and EASY!